Beautiful charts for your Silverlight application. 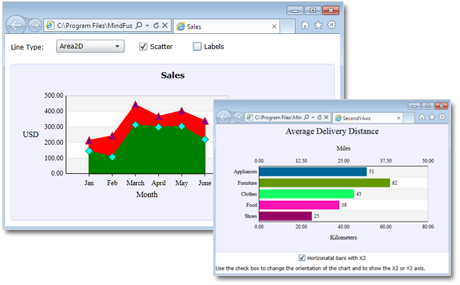 MindFusion.Charting for Silverlight offers you a fast and easy way to build any type of bar, line and pie chart. Each chart has a wide range of customization options - from its color scheme to its labels and legends. 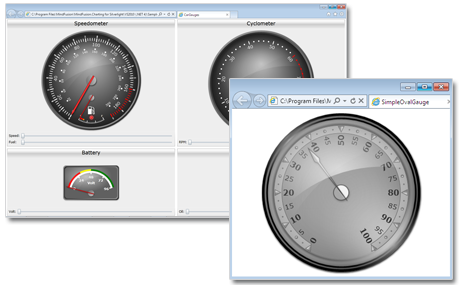 The tool supports various options for data input and includes a full-featured gauge control. Line and area charts can be stacked, show scatters at data points or just the scatters. They can be drawn with dashed lines and have as many series as you want. Custom labels can be drawn at data points. Bar charts can be drawn either horizontal or vertical. You can place labels inside as well at the top of the bars. The appearance of the bars is complete customizable - you can choose their color, width, the space between them. There are 4 bar styles, stacked bars are also supported. Each pie and doughnut chart can have detached pieces and a label inside and outside each piece. You can choose among several label types. In doughnut charts, you can set the internal radius. Data for the chart is set with data binding or data arrays. There is no limit to the number of data series in line and bar charts. Each chart supports positive and negative values. DataTime data in a variety of formats is also accepted. The gauge control supports oval, horizontal and vertical gauges. The gauges can show scales, pointers, ticks, labels or any FrameworkElement object. Their appearance is template-based and there are limitless possibilities for composition and skinning of each gauge you create.